The process of transitioning to eating more raw foods can take time as the body, thoughts, and emotions become accustomed to eating less cooked food. Every once in awhile we still enjoy something warm and steaming. And there are special occasions when we need a dish to serve to friends who aren't as inclined to want to eat that much raw food. Last summer the idea for this transition meal popped through the "intuition channel" to serve to friends for dinner, and they absolutely loved it! We made the dish with steamed Yukon Gold and new red potatoes, drained, then spooned over freshly chopped tomatoes. The heat from the potatoes warmed, but didn't cook, the tomatoes. Everything was slathered with a savory dressing. The tomatoes released their juices, resulting in a delightful broth—it became a meal akin to gumbo, so we served it in bowls with spoons! 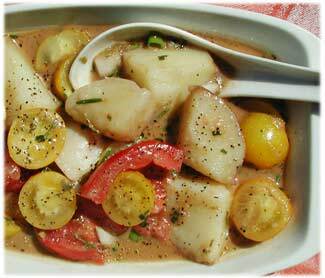 Potato and Tomato Gumbo is a part-raw and part-cooked dish that is richly flavored and satisfying. Teamed with a salad, this whole meal works out be about 70% raw and 30% cooked. It's a fabulous vegetarian dinner to serve to company—a delightful and simple feast. 3 cups chopped fresh tomatoes: red or yellow cherry, Heirloom, etc. Rinse potatoes, tomatoes, and green onions. Cut into 8ths to make large bite-size pieces. Put in steamer (using filtered water) over high heat, and sprinkle lightly with salt. Steam for 13-15 minutes until tender enough to insert a fork—don't allow to get mushy!! While potatoes are steaming, cut tomatoes into chunks. Make dressing with the water, oil, vinegar, lemon juice, balsamic vinegar, green onion, garlic, herbs, salt and pepper. Remove potatoes from steamer, and put on top of tomatoes. Mix all ingredients gently to thoroughly coat. Squeeze some fresh lemon juice over the top. Serve warm and enjoy! Or serve at room temperature on a hot day. Makes great leftovers. When a goal such as a desire to eat more raw food is held within the heart and mind, the body's actions soon follow. The body has such wisdom, and can give us an amazing amount of information, which is amplified when making full use of our intuition. We're all too familiar with the discomfort of doing things because we "have to"— forcing, cajoling, pressuring, whipping ourselves into line, or beating ourselves up if we don't perform or comply to a rigidly imposed belief system. Raw foodist and body builder, Mr. 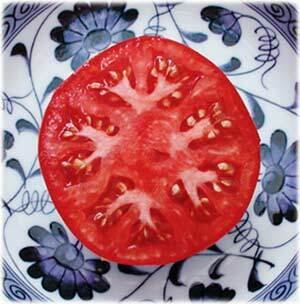 Nature Love, eats mostly 100% raw foods, but also eats some steamed veggies. He says, "The goal is to have a beautiful relationship with food and feel joy. And I feel because I do, that's why I've been able to come this far without a struggle. I'm healthy and happy. Food isn't my focus, it's my nourishment." His diet and his body building practice are both forms of meditation. In terms of continuing to move forward with our health, Rex and I have found the "easing into" philosophy works best for us—starting with small steps, and increasing when it feels right. This way we are honoring our whole being. Intuition is often the initiator for making a change, and it's never led us astray. We believe in transitioning at a pace that makes our hearts sing—doing so for love, not out of obligation, experiencing the joy that a steady and gentle evolution brings in the celebration of life. We eat to live, not live to eat! Even so, there's no denying the pleasure that comes from eating foods prepared with a heart of gold. Love then becomes our greatest healer, the ultimate guide and teacher, and quite possibly, the most perfect food of all!